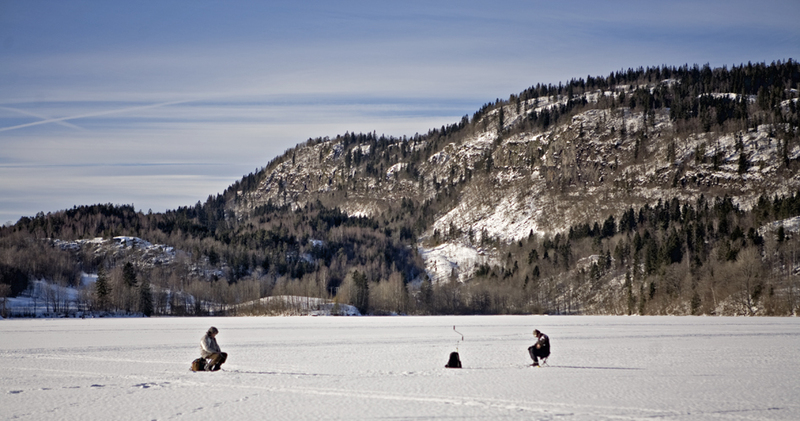 These two men are ice fishing. Alma, Topsy & I walked passed them on the lake, on Wednesday. Later we passed them again. I suppose it’s their hobby; I don’t think anyone is forcing them to be there. In the comments about the last post mab mentioned multi-tasking. I see this as a golden opportunity: you could play the mouth organ and read an ice fishing magazine while you ice fish. You could listen to an ice-fishing tape while you make sandwiches, and then eat them (the sandwiches). You could drink a mug of hot chocolate, and all the time you’re ice fishing. I’ve never seen an ice fisherman catch anything, except perhaps a cold. Are you merely assuming they are ice-fishing, Artur, or have they actually told you (and Alma) so, themselves? Perhaps it’s a recovered Ur-Le Carré-Memory, but it occurred to me the apparent preoccupation here might be a “cover”. They could for example be theoretical physicists, or language philosophers, under cover, privately considering a problem. Oh, look, one’s changed his posture slightly. Our local coarse fisherman look much like that to me: hours and hours near motionless in the cold, damp air by a fen, presumably escaping the boss, the missus, the children, and whatever else irks them. When I was a lad we fished for eels in the harbour but that hardly counts because we used to catch plenty. The apparent change in posture of the figure on the left may be down to the photographer having changed his station ever so slightly, would you not concede, dearie? Though I will give you that bit of a slouch — in which lay the source of my initial hypothesis. Yeah, it’s the slouch that I noticed. Still, at least it implies that he wasn’t suffering from rigour mortis. We sallied forth today with our sunroof open a crack. The crocuses are out en masse and the miniature daffs have started opening. Hurray! Alma won’t let me forget the time that we had a sunroof and I opened it, driving past the Oslo concert house, forgetting that the roof was covered with four inches of snow. Tom, I’m very glad you popped over. Those guys, the theoretical physicists, look as if their minds aren’t wandering nearly enough but on the other hand, being Norwegian I bet they’re much more rugged and vigorous than I am. Not difficult. Ideally, there would have been a gale blowing across the lake. “Coarse fishing”: I don’t think we have a synonym for that over here. What is this subcategory of angling? I believe that the main difference between your ice fishermen and ours is that yours walk out onto the ice and then sit there in the open, whereas ours drive out there using various motorized conveyances and take roofs and other modern conveniences along. Video games and satellite TVs, I imagine. I like the idea of taking a mouth organ (or, as we call it here, a harmonica). You’re supposed to play them with cupped hands, anyway. Cupped gloved hands in this case. The blowing would warm your hands a little. And that kind of sound seems about right for the quiet, spare, peaceful setting. Here’s one that connects with the last post. They call them harmonicas in England too – all except Larry Adler, famous US harmonica player, who lived in England and always insisted on ‘mouth organ’ (he was on BBC talk radio a lot when I was young). I use both words. It’s suggested here that the next phase in this icy sublacustrine fixation might be illustrated by the bottom photo here, showing Herzog’s subjects (actors? 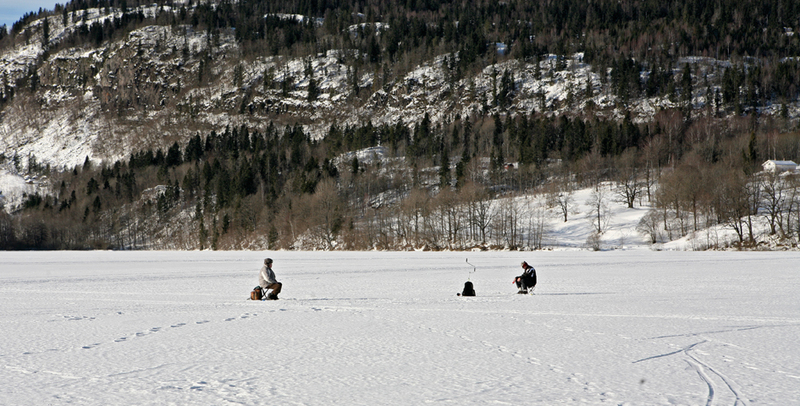 ice fishermen? nuclear spies? ), reportedly well plied with vodka by the director, straining to make out Bells from the Deep. You’re right. You’d kind of have to be drunk, because in that picture there’s quite a lot of water on the surface. I think there ought really to be sound emanating from the deep, though. I’ve never seen a water baby. I suppose fish make some noise, we have fish apparently. I did somewhat regret (speaking of) contaminating Traherne’s wonderful intuition of water babies pressing their feet up against his, with such drastic showbiz stuff. But then conscience always enters the scene a bit late to rescue the heroine. No! No! No! You see, the whole point is NOT multi-tasking. You sit there and listen to the, er, ice cracking. You notice the, um, breeze ruffling your fur hat. You stare at, well, the trees and sky. Your mind wanders. You relax. But not too much (don’t want to fall asleep and die of hypothermia). That said, I’ve never gotten ice fishing either. Way too uncomfortable. Here every spring after the authorities have planted a dozen “DANGEROUS! ICE THIN! signs around the shores of lakes and rivers, idiots go out on the ice in their 4-wheelers, fish and drink, drink and fish. And then the ice breaks and the emergency services fly in helicopters to rescue them. It costs a gazillion rubles for each rescue, and the local population generally thinks: Let the idiots drown. It will improve the gene pool. I guess that would be multi-tasking. Better to just fall asleep. I once had pike at a French restaurant in New York, and it was awful. I’ll never eat pike again. Just thought you’d like to know. The wiki article on pike says (in contradiction to the wiki article on coarse fishing) that pike are considered game fish, or sporting fish. In Finland, catching a kymppihauki, a pike weighing at least 10 kilograms (22 lb), is considered the qualification as a master fisherman. What about curling? The expat Canucks who run NZ’s national team said they were surprised when they moved here to discover that NZ’s tiny curling community still does its thing the old-fashioned way, on frozen lakes. That seems like a nice blend of the socially laidback elements of ice fishing with the advantage of just enough activity (and imbibing) to keep one warm. We have pike in our lake, so I’ve heard. I don’t like ’em. But I do like the idea of NZ’s tiny curling community. You couldn’t curl or skate on our lake, because of the snow. Well, you’d have to do some sweeping. At least you’ve got the ice, which is the essential thing. I do love a proper Franco-German miscegenation almost as much as I do tiny curling. Indeed I suspect one of my wife’s erstwhile gaggle of Kiwi beaux may have been a tiny curler. By the by, an Arctic Trough now dropping in upon us heightens a sense of cameraderie with your avalanche-prone outpost. Before total occlusion of the sky occurred however, there was the good fortune of seeing a fine appulse. I’m sure the positional astronomy where you are is so greatly superior, you too must have seen this? I must say, Crown, that your photos are routinely better than those in our local rag. Blimey, I could do better than that, you’re right. Anyone can take better pictures than that with an iphone. I think you ought to demand a refund. Tom, I did see that appulse last night – and thanks for the word, by the way – when I went outside to switch off the goats, at about nine or ten. It was high in the sky, and only those three bodies were visible; very lovely and strange it was. I thought of getting my camera, but by the time I came in again I’d forgotten. I really should finish making my morning coffee before attempting even the simplest of other tasks. Looking at TC’s Traherne post to see what people were talking about, I spent far too much time looking for the shadows of hydroelectric towers; and then after going back and forth to dearieme’s local-rag link a couple of times I found myself with a mental image of a young Englishwoman sprawled among the crocuses with her ear (or eye?) to the ground. That’s multi-tasking. I’d go back to bed, if I were you.